I grew up living in the country and active in 4-H Club and had a lot of experience with canning various fruits and vegetables. Over the years of married life, I have done some canning here and there when we have had a garden or fruit. This past summer I spent a lot of time at my local u-pick orchard picking raspberries, strawberries, blackberries, peaches, apples, etc. 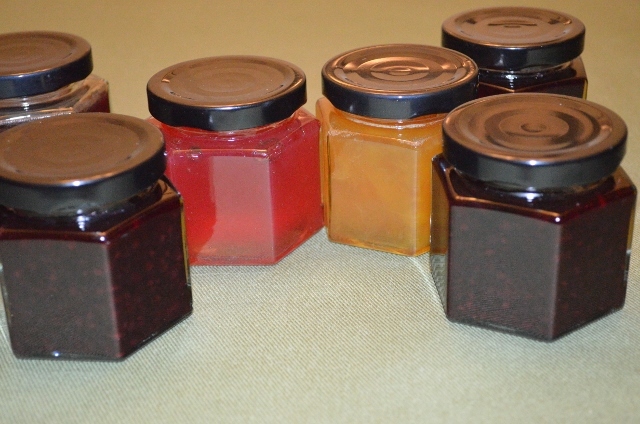 Planning for gifts, I turned much of my bounty into jelly and jam. I usually use the Ball Blue Book or Kerr canning books for portions and directions (I was too busy this summer to post the recipes). For the canning jars, I used the traditional jelly jars from Ball and Kerr and reveled in my beautiful jars of homemade preserves. Then…. this week as I was looking at various sites, I ran across Food in Jars. While the traditional jars and two-piece lids are always recommended for home canning, Marissa at Food In Jars also gives directions for using some of the jars/lids that are traditionally used for commercial canning. I loved the look of the hexagon jars and as it happens, the supplier for the jars (Fillmore Container) is less than an hour away. 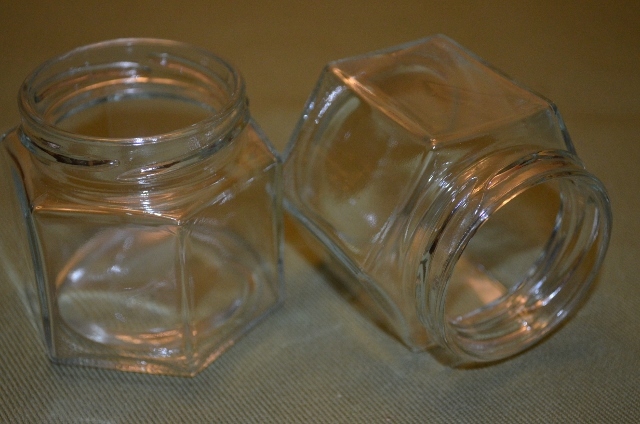 So before I knew it, I had ordered two boxes of 4 ounce hexagon jars with button lug lids and gone to the warehouse for pick up. The only problem is there is not a lot of fresh fruit available when there is four inches of snow on the ground. 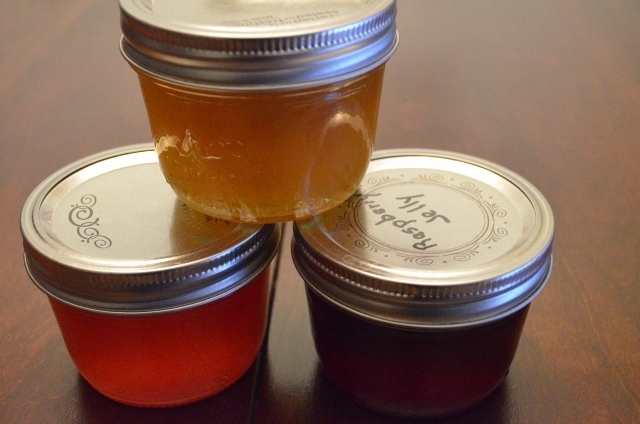 So I took the easy way out of opening some of the jars I canned this summer; reheating the jam/jelly and going through the usual canning process using the hexagon jars All of the directions are on the Food in Jars site – or follow the traditional canning directions from Ball or Kerr. Remember to read Marissa’s comments concerning using the lug lids about not tightening too much. I know it is not very practical to redo perfectly good jelly and jam but I really wanted to try the hexagon jars in time for some parties this week. 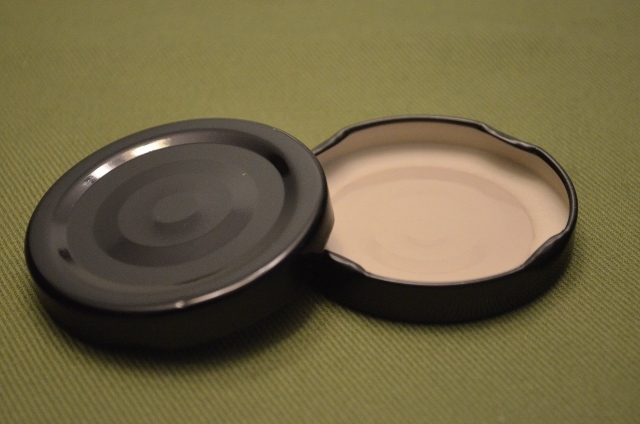 I usually don’t worry about my two-piece lids sealing as they are pretty dependable but this was my first time to use one-piece lug lids and it was really an experiment. I was thrilled as the finished jars started to cool and I heard the lids pop. I love the look of the hexagon jars and will probably try some of the other jars on the Fillmore Container site next summer. This is something I would only use with jams and jellies because they are so high in sugar and if a jar does not seal, you can just put it in the refrigerator until you are ready to use it. 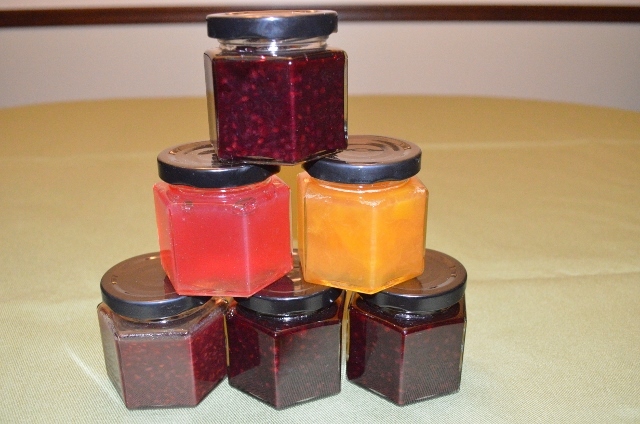 Take a look at Food in Jars if you are interested in canning or other recipes using jars.In the meantime, I will admire my jars of jelly and think about next summer’s harvest and try to avoid looking outside at the snow and ice.